Congratulations to Dr. Grant Johnson of Pacific Northwest National Laboratory and Dr. Xiao Lin of the Fritz Haber Institute on being selected as the first recipients of the Pacific Northwest Distinguished Post-Doctoral Fellowship. Through the fellowship program, they will receive funding to conduct their catalysis research at PNNL for the next 2 to 3 years. "We believe strongly in building the next generation of scientists and in advancing the frontiers of science," said Dr. Steven Ashby, deputy director for science and technology at PNNL. 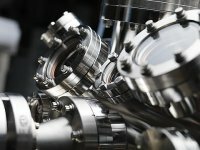 "I'm pleased we'll be able to expose these scientists to the unique capabilities, instrumentation and experts at PNNL while we also learn from their new ideas." Johnson completed his doctorate in chemistry at Pennsylvania State University. There, he focused on analyzing the use of different types of oxygen in reactions stemming from metal oxide catalysts. At PNNL, Johnson's research will focus on using mass spectrometry to create new catalytic materials. Lin has most recently worked as a Humboldt Fellow at the Fritz Haber Institute of the Max Planck Society in Germany. He received his Ph.D. from the Chinese Academy of Sciences. While at PNNL, Lin will develop a molecular-level understanding of how metals catalyze reactions involving carbon monoxide and dioxide. These reactions are vital to supplying energy, global warming, and the chemical industry. In 2009, PNNL created the Pacific Northwest Distinguished Post-Doctoral Fellowship to attract outstanding researchers and build the future of scientific leadership for the Laboratory. These post-doc fellows receive a competitive salary, benefits, and relocation expenses. In addition, they have the potential to receive extra funding for travel and conferences. Both will conduct research at the Department of Energy's EMSL, a national scientific user facility at PNNL.